For casual and relaxing holiday events, I always wear a pair of jeans and a top with a formal appeal. A pair of jeans styled with a button down shirt and a bow neck tie will be a great holiday dinner outfit or for a date with friends. For this post, I went with a black and white look rather than the festive red color and this Chicwish black and white cardigan sets the tone for the look. 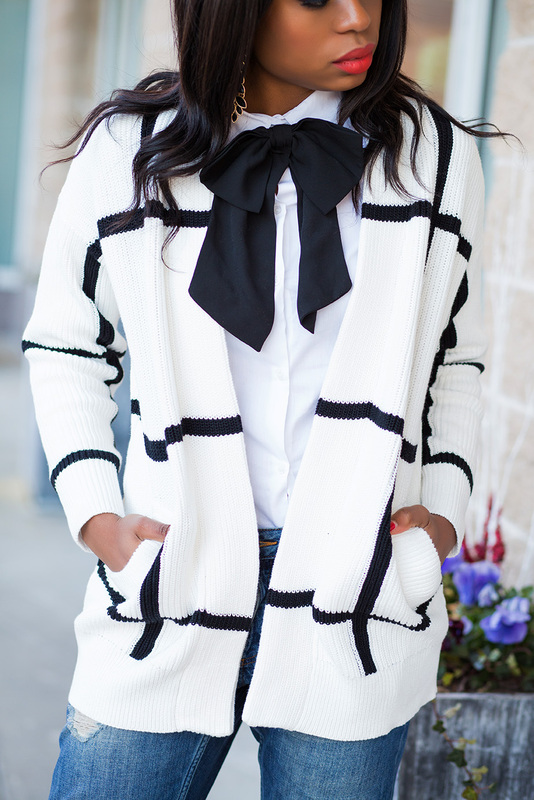 I love the black and white grid pattern on the cardigan and I complemented with a white shirt, black bow neck tie and black pumps. The addition of the bow neck tie gives it a different festive feel. This post is sponsored by Chicwish. As always all opinions are mine.